When your baby’s first teeth come in, you might not think it necessary yet to worry about tooth decay. But even infants can develop this common dental disease. 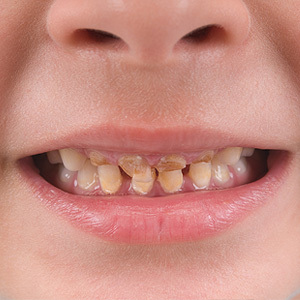 In fact, it has a specific name in children 6 and under: early childhood caries (ECC). About one-fourth of U.S. children have ECC, and poor or minority children are at highest risk. Because of primary (“baby”) teeth’s thin enamel layer, ECC can spread to healthier teeth with unnerving speed, causing extensive damage. While such damage immediately affects a child’s nutrition, speech development and self-esteem, it could also impact their future oral health. Permanent teeth often erupt out of position because of missing primary teeth lost prematurely, creating a poor bite. And children with ECC are more likely to have cavities in their future permanent teeth. While there are a number of effective treatments for repairing ECC-caused damage, it’s best to try to prevent it before damage occurs. A large part of prevention depends on you. You should, for example, begin oral hygiene even before teeth come in by wiping their gums with a clean, damp cloth after feeding. 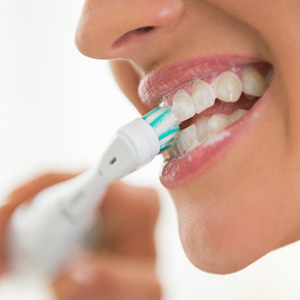 After teeth appear, switch to daily brushing with just a smear of toothpaste. Because refined sugar is a primary food source for decay-causing bacteria, you should limit it in their diet. In the same vein, avoid sleep-time bottles with fluids like juices, milk or formula. As they grow older, make sure snacks are also low in sugar. You should also avoid spreading your own oral bacteria to your baby. In this regard, don’t put their eating utensils or pacifier in your mouth and don’t drink from the same cup. Avoid kissing your baby on the lips. 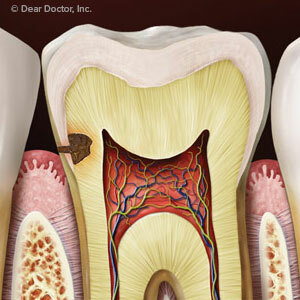 And above all, take care of your own oral health to prevent your own encounter with dental disease. Finally, start regular dental visits on or before your baby’s first birthday. 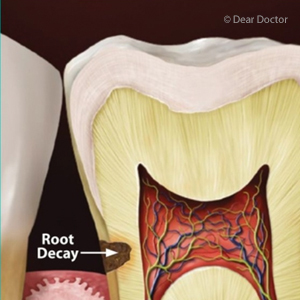 Regular cleanings and checkups increase the chances for early decay detection, as well as provide for treatments and prevention measures that can reduce the disease’s spread and destruction. ECC can be devastating to both your baby’s current and future dental health. But with vigilance and good dental practices, you may be able to help them avoid this serious disease. If you would like more information on tooth decay prevention in young children, please contact us or schedule an appointment for a consultation.